A nice casual look can be achieved in your bathroom by decorating with homemade curtains using towels, in your choice of color or pattern. This is a guide about making curtains from towels. Has anyone made towels into curtains with grommets? I would like a spa looking bathroom and I have two windows above my corner tub. It is a large bathroom and the kids do come in at times and like to play in the big tub. I do not own a sewing machine, but I could borrow one to do this. I have not found what I have been looking for in the ready made version. I thought if I could add grommets to a ready made luxury towels that I would have an instant look that gave me privacy. I have and would NOT recommend it. Towels are made from terry cloth and the grommets just don't cover enough of the fabric around the cut to prevent it from unravelling. I also tried putting an "iron on" patch on the backside then the grommet. But the patch only stuck to the top of the terry loops and then it was too thick for the grommet. The best way I have had for curtains (I have done this several times) is to just sew a simple straight seam along the top for my curtain rod. You could even do this by hand. Another advantage to this is later you can take out the seam and it becomes a towel. Also remember they fade from the sun. I have had best luck using white towels for curtains. I made curtains using towels, for our camper. Instead of using grommets, I went to the hardware store and bought large washers. Sprayed them the color I wanted, and when dry, used fabric glue to attach them, and an awl to make the center hole. I put them on a table, with a heavy weight on them, until dry. This was done 3 years ago, and they still look nice. Go through the washer and dryer with no problems. You can even change the washer color with a small brush, whenever you want an update! Good luck! I have made bathroom curtains from towels for years. I just get the towels I want and use the cafe clips - they hold great! 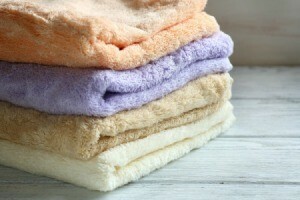 The nicest part is the towels are not ruined and can be recycled for their original use. Towels too long? Simply fold to right length and clip making a valance.